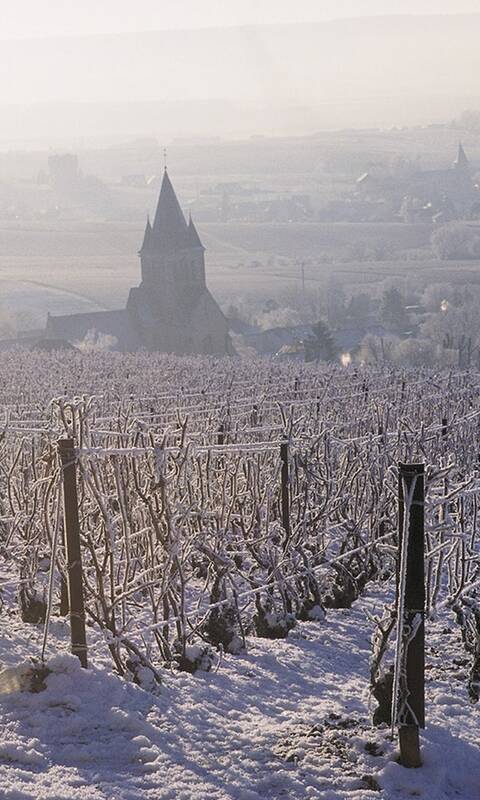 Champagne, the only region in the world that produces champagne. Champagne wines only come from the Champagne region. Strict specifications for production methods. Limited sun exposure, balanced by hilly topography. A poor substrate in which the vines find their own strength. Naturally regulates heat and moisture. Gives Champagne its mineral notes. The modern day Maison of Veuve Clicquot possesses one of the finest champagne vineyards, both in terms of its size and the quality of its vines. Its 390 hectares are divided between 12 of the 17 Grands Crus, and between 20 of the 44 Premiers Crus that constitute the entire Champagne region. This exceptional heritage was built up over the centuries, founded upon the parcels first established by the founder, and added to by subsequent vineyard directors. 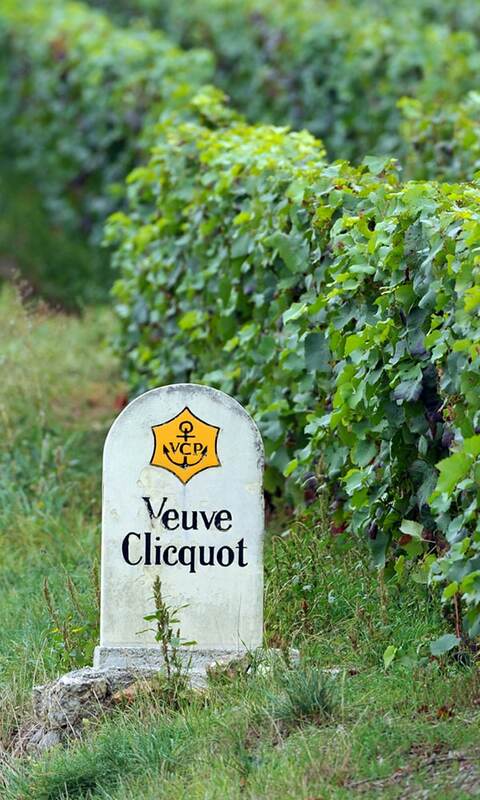 In particular, Veuve Clicquot bears the fortuitous territorial mark of Madame Clicquot. as Grands or Premiers CrusWhile the latter only represents a quarter of the total surface of vines in the entirety of the Champagne region. Each plot’s grape variety is determined by assessing its soil, climate and exposure. The Veuve Clicquot vineyard is comprised of 47% Chardonnay grapes, 36% Pinot Noir and 17% Pinot Meunier. The Clicquot vines are mostly situated on gentle sloping hills allowing the vines to benefit from shallow soil and a maximun exposure to sunlight. Since its foundation, the Maison of Veuve Clicquot has also established a strong partnership with its fellow winegrowers in Champagne. These providers of grapes and white wines help insure the consistent quality of the Veuve Clicquot wines. Around 100 of our winegrowers have mastered the different facets of grape growing and production. Over the course of the year, they may be bolstered by additional of seasonal workers and, at harvest time, by over 1000 harvest workers who come to help pick grapes. Spread over a landscape of hills, the Veuve Clicquot vineyards are in an optimal position to catch the sun’s rays. These zones are defined according to key criteria from the AOC, delineating sun exposure, sloping, soil and subsoil. A north-facing position leaves the vines exposed to variations in climate such as frosts and winter or spring, causing unfertilized grapes or grape drop however, it can also result in a moderate rainfall and temperatures, with a temperate summer and autumn seasons. Our vines are selected for their quality rather than volume of production. They are also chosen to insure a harmonious blend between the three varietals (Chardonnay, Pinot Noir, Pinot Meunier) as well as the different terroirs of the vineyards. This is the last chance for upkeep of the soil, and to prepare the old vines that will be removed (each year, several hectares of vines are pulled up in order to renew the vineyard). The leaves have all fallen. A mechanical trimming of the vines is followed by a manual cutting of each one. The roots of the vines are fed with fertilizer. The vine cutting stops mid-month, and starts again in mid-January. The old trellises are pulled out and new vine shoots (sprouts from the year) are planted into the earth. Rigorous pruning limits and focuses the number of buds, and evens out the vine’s shape. The soil is nourished with organic fertilizer (sheep manure). The buds start to grow. The remaining shoots are bound to trellis supports. New young vines are also planted at this time, to renew the vineyard. The buds open and the first leaves appear. Binding ends, and the mechanical maintenance of the soil begins again. The young shoots that don’t bear grapes are trimmed away. Herbicide and pesticide treatment of the vines begins. The branches are lifted vertically and attached to supports, ensuring that they are exposed to the sun and benefit from the greatest possibility of photosynthesis. Flowering occurs in the middle of the month, as the grapes form. The soil is maintained (between the vineyard rows and under them) and the vines are protected from infections and insects. The grapes start to change color and ripen. The growth of the branches stops and they change from green to brown – this is their “aoûtement” – their protection against the cold. The materials required for harvesting and pressing the grapes is prepared. The maturity of the grapes is carefully tested. Harvesting takes place between mid-September and the beginning of October. The exact harvest date is officially set each year per the recommendations of experts, based on the maturity of the grapes. Cutting, binding, maintaining soil, fighting disease - the vines demand a lot of time and attention. A vine has an average lifespan of 40 years, and according to its age a vine often requires different treatment. One hectare of vineyard requires 380 to 420 hours of work per year, without counting the intense work of the harvesting. A vine has an average lifespan of 40 years, and according to its age a vine often requires different treatment. Throughout the year, work is carried out as part of a sustainable viticulture, respecting the terroir, the environment, Mother Nature, and the safety and security of our staff. The protection of the vines against fungal diseases and insects is an essential part of preserving the vines, of ensuring the quality of the leaves, and of the quality of the grapes. This protocol requires precise management of the frequency of treatments and a sound understanding of the best choices for managing vines. Conserving the vineyard soil insures the balanced nutrition of the vines, avoids weed growth, and prevents erosion. At Veuve Clicquot, we nourish our soil with respect to the environment, exclusively using organic fertilizers. Veuve Clicquot reduces the frequency of weeds with grass strips between the vineyard rows, and by trimming under the vines via mechanical means without using pesticides – for the majority of our vineyards.